The Persian Gulf is in between Iran and Saudi Arabia. It runs from the mouth of "Shatt el Arab" in north, to the "Strait of Oman" in the south. Its length is 600Kms and the breadth varies from 290 kms to 46kms. The first Western Power in the Gulf was Portuguese, which came in between 1481 and 1487. They remained supreme in Gulf till 1621 and ceased to exist in between 1640 and 1650. The British arrived in 1598, established first factory at Jask in 1619 and remained in low note. The Dutch visited Gulf in 1624 and soon became supreme in trade. They remained masters of the trade till 1708 but by 1760's lost all trade. Thus British became paramount. "Treaty of Peace in Perpetuity" was signed in 1853. And its main function was the British Government should keep the peace in the Persian Gulf and all maritime disputes should be referred to them for arbitration. Different treaties and agreements were signed, by which Great Britain alone was empowered to establish a Postal Administration. The Britishers opened Post Offices under Indian Postal Administration. The first Postal Agency in the Gulf was opened at Muscat in 1856. Since then Bushire (1857), Ling (1867), Bandar Abbas (1867), Jask (1880), Bahrain (1884), Mahommera (1892), Kuwait (1904), Dubai (1909), Henjam (1913), Abadan (1914) and Ahwaj (1914) were opened. After the World War I, the conditions and values changed. The British influence was undermined. In 1923, all Indian Postal Agencies in Persia closed down. Only in areas on the western shore of the Gulf, the Postal Agencies continued in Bahrain, Dubai, Kuwait and Muscat. These 4 Postal Agencies were first under Bombay Circle and afterwards under Sind Circle but managed all along from Karachi Foreign P.O. They were using Indian Stamps but from 1st April 1923. 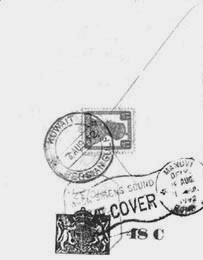 Kuwait started using Indian Stamps overprinted "Kuwait" and from 1933, Bahrain started using Indian Stamps overprinted "Bahrain" and Muscat & Dubai went on using Indian Stamps without any overprint. We still find Indian Stamps without overprint "Kuwait" being used from Kuwait. Therefore, after partition of India Dubai and Muscat used Pakistan Stamps from 1st October 1947 till 31st March 1948. The Postal Administration of Bahrain, Dubai, Kuwait and Muscat in the Persian Gulf was taken over by His Majesty's Government and British Postal Office Agencies on and from 1st April 1948. Therefore, postal articles for and from the Postal Agencies were treated as foreign postal articles from 1st April 1948, vide Postal Notice No.67 dated 30th March 1948.
Letters, Single and reply paid post cards, Printed papers, Business papers, Sample packets and Blind literature packets. Parcels exceeding 22 lbs., in weight were not allowed. Insured letters and parcels only were accepted but limit should not exceed Rs. 3000/-. Money Orders, Indian Postal Order and V. P. Services were suspended on and from 1st April 1948. With effect from 1st April 1948, the rate of postage was raised to full normal foreign postage rate. Letters not exceeding 1oz. would be 3½as and every additional oz. would be 2as. Post Card single would cost 2as and reply paid would be 4as.Printed papers would be 9 pies for every 2oz. Business Papers not exceeding 10oz. would be charged 3½as. and 9 pies for every additional 2oz. Sample Packets not exceeding 4oz. would be charged 1½as and every additional 2oz. would be 9 pies. Blind Literature Packets would be ½ anna for every 2½lbs. The maximum limit is 17½lbs. Pre payment of postage is compulsory vide Postal Notice No.66 dated 29th March 1948. The Air mail Fees inclusive of postage would be 6as per ½oz. for letters and 3as for Post Cards. When Air mail rates were revised on 1st September 1950, some changes were seen in Persian Gulf Countries. The air mail rate for letters were increased to 8as for Post Card to 4as and rate for Aerogramme was fixed at 6as only. Source: Mr. Ashok Kumar Bayanwala, Ahmedabad.